Random orbital sanders (sometimes called random orbit sanders or simply orbital sanders) are a type of sander built so that the sanding pad delivers random orbital action. Which gives you the speed and power of belt sanders while still giving you a finer finish than an orbital finishing sander. While you might get away with rotary tools for many small sanding jobs, an orbital sander is what you need for real professional projects. A random orbit sander will also utilize a circular sanding pad, rather than a square pad, which provides you with smoother sanding action and increased maneuverability. There is also a variation of the orbital sander known as the orbital finishing sander, which is more suited for rounding sharp edges and sanding smooth wood. 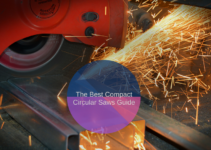 An orbital finishing sander also provides a much lower risk of damaging the workpiece and is generally more lightweight and quieter than a random orbital sander. 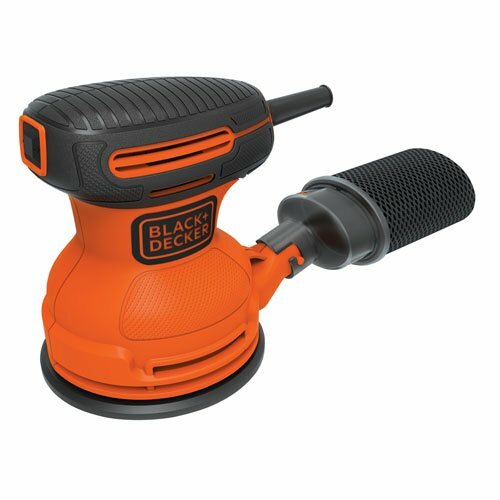 The Black & Decker BDERO100 5-inch Random Orbital Sander provides you with random orbit action that gives you a high-quality finish and a high removal rate, as well as a hook & loop paper changing system that makes it quick and easy to change out the sandpaper. In addition, the sander comes equipped with a dust sealed switch in order to extend the life of the tool, so you won’t have to replace it due to internal dust buildup. It also provides you with efficient material removal and a compact size for improved maneuverability. 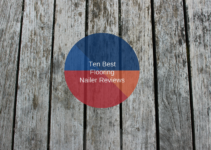 Overall, this 5-inch sander is a great option if you’re on a budget and are looking for a cheap and high-quality orbital sander that will last a decent amount of time. 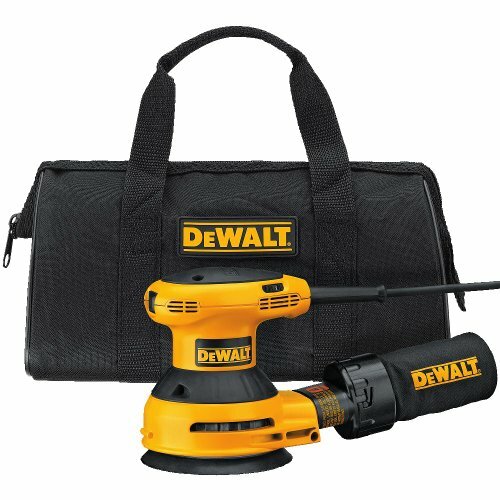 DeWALT’s D26453K 5-Inch Random Orbit Sander Kit is a must-have if you’re looking for a great variable speed random orbit sander. The sander includes a high-quality dust bag made with cloth and a controlled finishing system for maintaining pad speed and minimizing gouging while the sander starts up. The electronic variable speed motor is able to adjust from 7,000 to 12,000 OPM for ideal sanding speed for any application. The body is constructed with an anti-slip texture and improved grip, as well as an ergonomic design for extreme comfort and control. The random orbit sander also includes a sealed ball-bearing construction and dust-sealed switch for far longer tool life and durability. The DeWALT D26453K 5-inch Random Orbit Sander is a great choice if you’re looking for a sturdy variable speed random orbit sander that’s built to last. 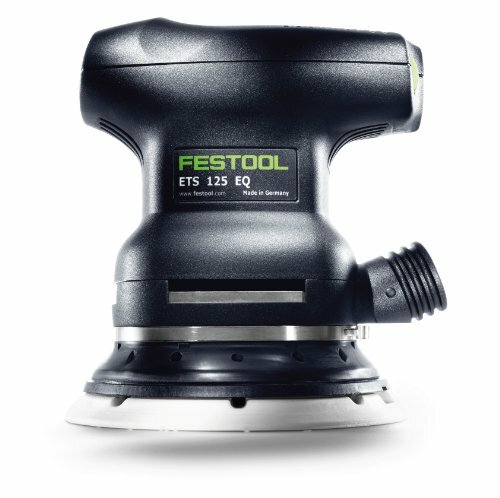 The ETS 125 EQ Random Orbital Sander from Festool is a high-quality random orbital sander that’s built ergonomically for comfortably fitting in any hand, as well as being light and compact enough for long periods of overhead and vertical usage. It’s designed to give you fine finishing results and is equipped with a high-quality dust extraction system to keep the workplace free of dust. The StickFix abrasive removal system makes pad replacement easy with its pad hooks and fabric backing, so you don’t have to hassle with abrasive pads. Overall, it’s an excellent random orbital sander, and is well worth the price, especially with the step-less variable speed settings, which allow you the sander to conform to your needs. 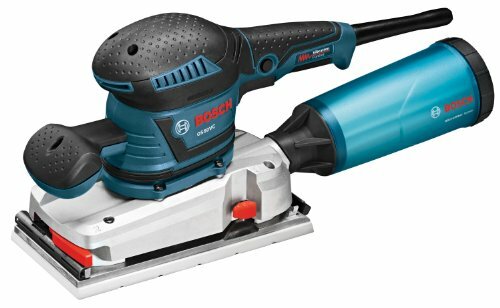 The Bosch 3727DEVS 3.3 Amp 6-Inch Random-Orbit Variable-Speed Sander is rugged and durable. It is built with a large integrated dust canister and a die-cast aluminum gear housing. The variable speed control allows it to operate between 4,500 and 12,000 OPM while providing a smooth and precise finish. The rugged gear housing is equipped with a dual-bearing mount pad with constant response circuits for a more durable design and protection from electrical overload. This 3.3 Amp orbital sander is perfect if you need a rugged and effective random orbital sander that can take on anything you throw at it and still provide you with a high-quality finish without damaging your work piece. The 18 Volt, Lithium-Ion, Makita XOB01Z LXT 5-inch Cordless Random Orbit Sander is a cordless sander built to be highly mobile and its ergonomic design provides the user with increased comfort. The cordless sander utilizes a high-quality lithium-ion battery, which can last for up to twenty minutes on high speed or twice that on low speed on one charge. In addition to the cordless design and long battery life, the sander also provides you with a simple one-touch electronic speed control system that can switch between 7,000, 9,500, and 11,000 Orbits Per Minute. This gives you quick and simple control of the sander’s speed and allows you to adjust it for any job. Overall, this is the perfect sander if you don’t want to deal with cords, but still want enough power and battery life to get the job done well. Porter-Cable’s 7346SP 6-Inch Random Orbit Sander is a larger random orbital sander ideal for marine or automotive applications. It provides you with variable speed ranging from 2,500 to 6,800 Orbits Per Minute and includes both a sanding disc and polishing pad for automotive applications. The 4.5 amp AC motor is built for improved overload protection and the body features a removable handle which can be mounted on either side of the tool. The sander will accept 5/16 to 24 spindle thread accessories and offers full ball and roller bearing construction for high durability. The Porter-Cable 7346SP 6-Inch Random Orbit Sander is a great sander perfect for any automotive or marine uses and is also great for general use as well. 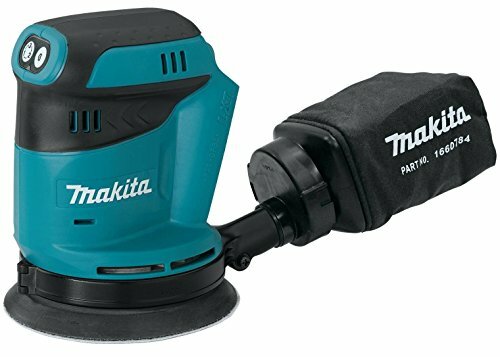 The BO4556K 2 Amp 4-1/2-Inch Orbital Finishing Sander built by Makita is a compact, ergonomic, and high-quality orbital finishing sander built for smoothness and efficiency. 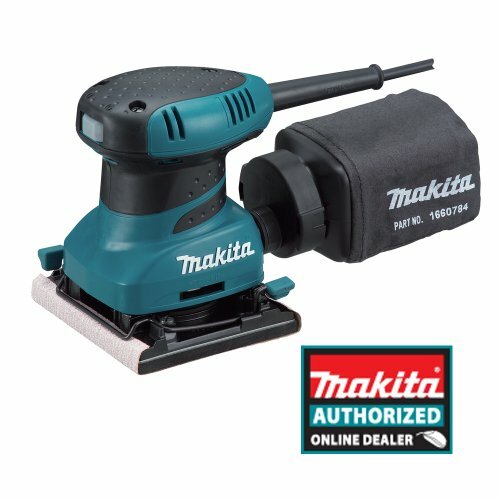 The sander runs at 14,000 Orbits Per Minute for extremely fast and smooth sanding and features a complete ball-bearing construction to significantly reduce noise and vibration. The rubberized and contoured palm grip provides you with drastically increased comfort and control. 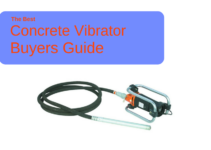 Sandpaper installation is extremely easy due to the large clamping lever. Dust is also taken care of with an efficient dust collection system that provides you with a far cleaner work environment, and the switch is rubber sealed to prevent internal dust contamination and increase tool life. This is the perfect orbital finishing sander for anyone who’s looking for a high-quality orbital finishing sander that’s built for speed, efficiency, and comfort. 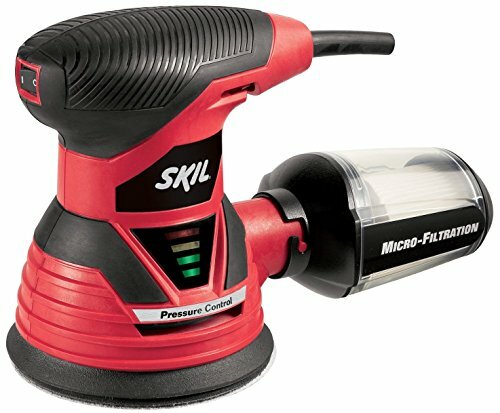 The 2.8 Amp, SKIL 7492-02 5-Inch Random Orbit Sander is a great sander that includes an advanced pressure control system which warns you whenever you’re applying excessive amounts of pressure. This feature can come in handy when you’re working with more sensitive materials, or if you need a more even finish. In addition, the tool includes an integrated pad brake to significantly reduce gouging. This random orbital sander also includes a clear view dust canister and micro-filtration system so you never have to hassle with dust or particles, and checking whether or not the canister needs emptying is as simple as looking at it. Overall, this is a great sander for jobs where pressure control can come in handy, and where dust and particle control is important. 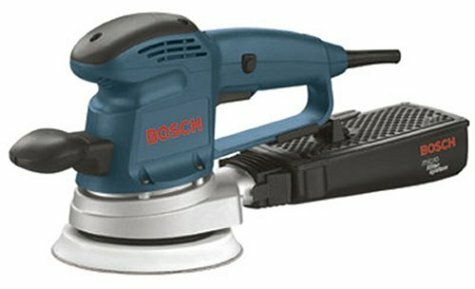 The 3.4 Amp, 120 Volt Bosch OS50VC Variable Speed 1/2-Sheet Orbital Finishing Sander is a powerful high-end orbital finishing sander designed for superior handling and maximum orbital sanding speed. The sander features an exclusion suspension system to minimize vibration to provide you with maximum comfort and precise handling. In addition, the sander includes a variable speed system to allow you to use whatever speed matches the current task. The sander also includes a high-quality paper clamping system with paper-tensioning and compatibility with stick-on paper. It also has a translucent microfilter dust canister with an integrated filter and an easy-empty screw cap. This orbital finishing sander is one of the best available and is extremely high-quality, as well as packing an impressive list of high-end features. 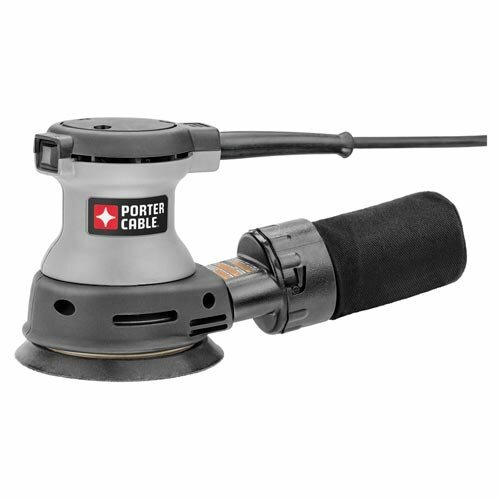 Porter-Cable’s 382 5-Inch Random Orbit Sander features a completely sealed 100% ball bearing construction and a dust-sealed switch for improved switch life and high durability. It features a counterbalanced dual-plane fan that reduces the user’s fatigue and provides a smoother finish. In addition, there’s an integrated controlled finishing system for maintaining controllable pad speed and minimizing gouging during start-up. The Porter-Cable 382 5-Inch Random Orbit Sander is a great lower-end sander if you want something that isn’t too cumbersome and provides a smooth finish while still maintaining a high level of durability.